For a while now I have wanted to apply sketchnoting to the process of language development. 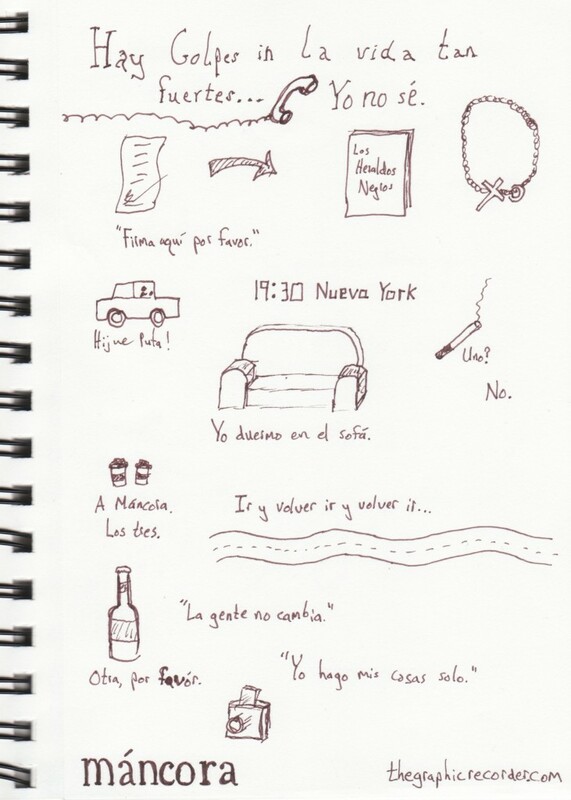 I got the chance to do just that last weekend when I watched a couple of Spanish-language movies with a sketchbook and pen in front of me. 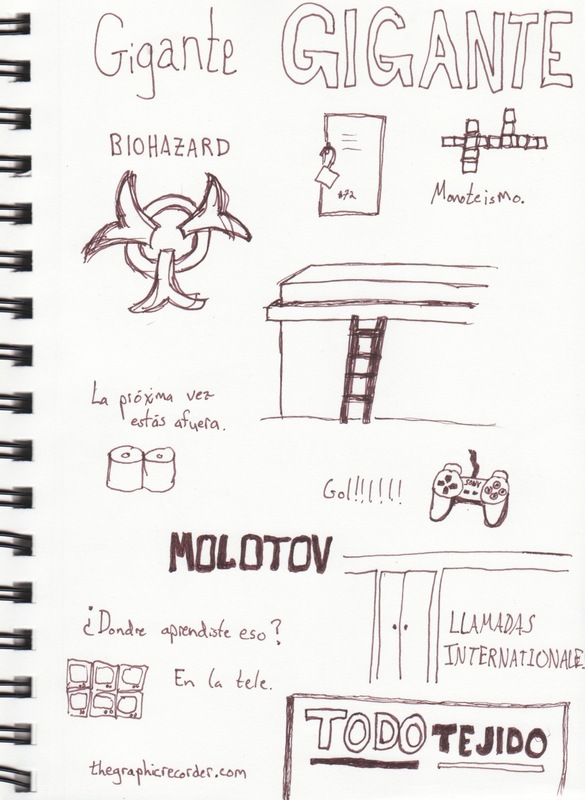 The images below show some of the quick sketches that I did while watching Máncora and Gigante. Take a look at the sketches below and my brief descriptions of the movies, and then we’ll talk about the benefits of sketchnoting while watching a movie. Máncora is a small coastal town in Peru. I spent a few days there during a year studying and traveling in South America. That fact is what drew me to this movie as I was browsing Netflix’s collection of Spanish-language films. [Note: this movie is definitely for mature audiences only] The main character of the movie, Santiago, flees Lima after a family tragedy and heads for the paradise of Máncora, attempting to escape his problems, but ultimately coming to the conclusion that he must face them head on. Standard narrative, but unique enough plot to be an entertaining movie. There is not a whole lot of dialogue in Gigante. But it doesn’t need much dialogue because it’s about a guard whose job is to monitor the security cameras of a large grocery store. While doing that job he becomes obsessed with one of the cleaning employees, whom he non-threateningly stalks throughout the rest of the movie, which is surprisingly funny. One of the important milestones in learning a language is the transition from translation to instinctual communication. Rather than thinking first in English, then trying to remember the Spanish version of that word or phrase, the ultimate goal is to go straight from the idea itself to the Spanish word or phrase that represents that idea. By sketching images and phrases from the movie, you are training your brain to make that direct association. You are literally creating connections in the brain that were not there before. That’s what language development is all about. Another important aspect of learning a new language is incorporating common phrases into your speech. This is hard to do at first because you are so focused on learning the names of individual things. By pulling out key phrases from the movie you will begin to build up a repertoire of phrases that you wouldn’t have constructed on your own from the individual vocabulary already under your belt. Since you are pulling out phrases important to the plot of the movie and then drawing quick sketches related to those phrases, you are increasing your ability to remember and use those phrases in the future. A final benefit of sketchnoting a movie comes from the physical product that you create. If you keep adding small sketches throughout the movie, then by the end you will have a useful resource to return to in the future to remind you not just of the plot of the movie, but also of the vocabulary you learned (or solidified) while watching and sketching. I anticipated the benefits of sketchnoting a movie to language development. What I did not anticipate were the benefits that extended beyond language development. Read on to hear about other discoveries that I made. By taking the sketchnotes above, I felt like I was participating in the movie. I enjoyed that aspect of what is normally a sit-back-and-watch activity. I also felt more engaged throughout the movie due to the attention required to pull out key images and phrases. By pulling out key images, words, and phrases, I was able to make connections throughout the movie that I otherwise might not have appreciated. In the end I felt that I had a deeper understanding of the movie as a whole. I think a lot about creative constraints. I like to vary the mediums and conditions in which I work to see what new forms of creativity result from those variations. The biggest creative constraint of sketchnoting a movie: time. You have got to sketch fast. You don’t want to spend so much time on the sketches that you lose track of the movie. In the sketches above, notice that I mostly sketched only single objects, sometimes with a word or phrase associated with them. That’s because my time was limited. Since one of my long-term goals is to get good at live graphic recording, this quick sketching is good practice for me. And unlike the process of sketching information that is solely audio, the process of sketching a movie gives you visuals to work with. You don’t have to draw from your imagination; you can draw directly from what is on screen. Another great way to build your visual vocabulary. I undoubtedly missed a few details of the movies that I watched because of the time that I spent looking down at my sketchbook and not at the screen, but I think the impact of whatever I missed was far outweighed by the benefits I described above. So the next time you’re watching a movie at home or in class, try watching it with a sketchbook in hand. Then come back and let me know how you liked it.